By the 1920's America's companies embraced promoting employee relations and internal marketing advancements by publishing human interest stories in their company magazines. These stories highlighted employee promotions, but also featured employee's hobbies, showcased children of employees, announced marriages and deaths, military service, and more. For genealogists it's good to know that not only top executives were highlighted. Looking for an ancestor's photo? Family researchers may not only find an article filled with genealogical information, we may even find a baby picture, marriage picture, or a photo of your ancestor in uniform. Obituaries of company employees were often much larger and more informative than those printed in the newspapers. An ancestor's occupation is noted on many documents: city directories, census records, naturalization records, etc. A few of these documents will actually list the company's name. I often find company names on state death certificates or in obituaries. Armed with this information, the researcher will want to identify any historic industry magazine or internal company publication. Corporate magazines became prevalent in the 1900s with a rise in popularity late 1920's. Where To Find Company Magazines? WorldCat is a great place to start. A quick inquiry led me to libraries that held historical company magazines, but be sure to contact local libraries and museums. At the recent Missouri State Historical Association conference, Dennis Northcutt of the Missouri History Museum and Library shared examples from its genealogy collection of company magazines, some St. Louis company specifically, other nationwide companies highlighting personnel from across the nation. This collection is in the process of being indexed, some series already completed (Genealogy & Local History indexes). Union Electric Magazine of the 1930s periodically ran a Perfect Baby issue with baby pics of children of their employees. This magazine also ran human interest stories of weddings and photos. Currently 70,000 names from 70 years are being indexed at the Missouri History Museum and Library, St. Louis. Voice of Emerson from the Emerson Electric company (not yet indexed. ) also highlights St. Louis area employees. Not just companies, but historic neighborhoods also published newsletters, highlighting gossipy news, but announcing promotions, family births, deaths and marriages. One plus, is these small newsletters also documented when neighbors moved and announced their new location. 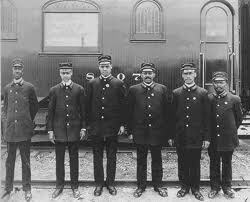 African American employees were also highlighted. Company employee's loyalty and longevity were announced as were favored employees. I located information on a client's Florida ancestor who was an elevator operator. The obituary printed in the company magazine gave a short employment history and information on his WWI service history. The Transit News, a magazine of the St. Louis Public Service, featured Randle H. Ross in an article of "A Black with Track Department. Ross, a service man, had served in the Army. A photo accompanied this article. For more information visit Genealogy Clues in Company's History.